Freemasonry dates to 1717 when several Lodges joined together to form the Grand Lodge of England. In 1733, Henry Price was awarded the charter to form the Massachusetts Grand Lodge, the first in the Western Hemisphere. Paul Revere and Joseph Warren (hero of Bunker Hill) and several founding fathers of our country were Masons. Through the shared experience of Freemasonry we enjoy a unique bond of fellowship with our Brother Freemasons wherever so dispersed. A Mason is a special kind of friend - a true Brother. Freemasonry has been described as a beautiful system of morality, veiled in allusion and illustrated by symbols. Freemasons use symbolism to guide self-directed enlightenment that "makes good men better". ​We espouse three basic principles: brotherly love, relief and truth, which are represent of our goal to live a tolerant and understanding life; to practice charity and lend a helping hand; and to have a firm resolution to always be good and true. Charity is a core mission. Frank W. Thompson Lodge engages in several important Bedford community events including our sponsorship of the Danny Oates Road Race held each "Bedford Day" in September. Proceeds from the race supplemented by funds from the Lodge provide scholarships to local students. Our Lodge also sponsors Boy Scout Troop 114 and an Angel fund that provides eye glasses, clothing and camp tuition to local children in need. Frank W. Thompson Lodge is in the 14th Masonic under the Grand Lodge of Massachusetts. Our Lodge greatly appreciates the support of our Brethren in the surrounding communities as we work together to celebrate the greatness that is Freemasonry. Frank W. Thompson Lodge was awarded the Grand Master's Award from the Grand Lodge of Massachusetts in recognition of outstanding service to Freemasons and the Community during the 2014-2015 Masonic year (photo above) and the 2016-17 Masonic year (header of this page). 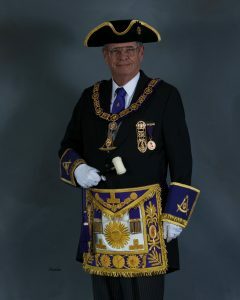 ﻿Frank W. Thompson Lodge received its charter from the Grand Lodge of Massachusetts under the direction of Most Worshipful Grand Master. In 1733, Massachusetts was the third Grand Lodge to be established and the first in the Western Hemisphere.